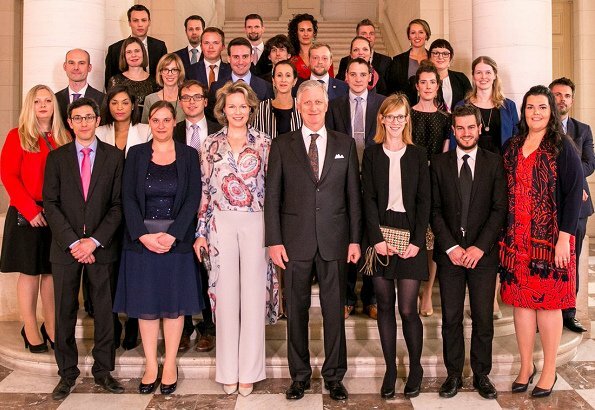 On the evening of April 5, 2019, Belgian King Philippe and Queen Mathilde hosted a dinner at Laeken Castle for young judges and young public prosecutors from different courts in Belgium. That was a date with her boyfriend, not an official engagement. Typically those don't get covered on this blog. Oh my gosh, this is the first time I've loved Mathilde in pants, and I really adore this whole outfit! She looks spectacular. Likewise, I think she looks beautiful. Great tailoring and perfect fit. She is such a lady (not just because of who she married). Nice pant not keen of the top-coat what ever. At first glance this looked like a major improvement - the top was at a good length but then there’s this long tail hanging down in back! Who the heck designed this? Pants, hair, makeup are all great. Ich finde es nett, was sie trägt. Nur hätte hier ein Rock oder Kleid dem Anlass entsprechend besser gepasst. Sogar viele der weiblichen Gäste trug Kleid oder Rock. The Queen looks lovely - the tailoring of the trousers is great as is the colour. I like the soft prettiness of the top. Her hair is a show stopper again! A bit below her best hair style but I cannot see reasons for the very hard comment. Show stopper is a compliment not a criticism, MaryT. Many thanks, Franny, yes, it was meant as a compliment, as her hair ONCE AGAIN, looked stunning! So, MaryT, I definitely did not mean my comment to be "hard!" ok, thanks for correcting me.